The Shores of Yellowstone Lake. Geology Sheet XXVII. 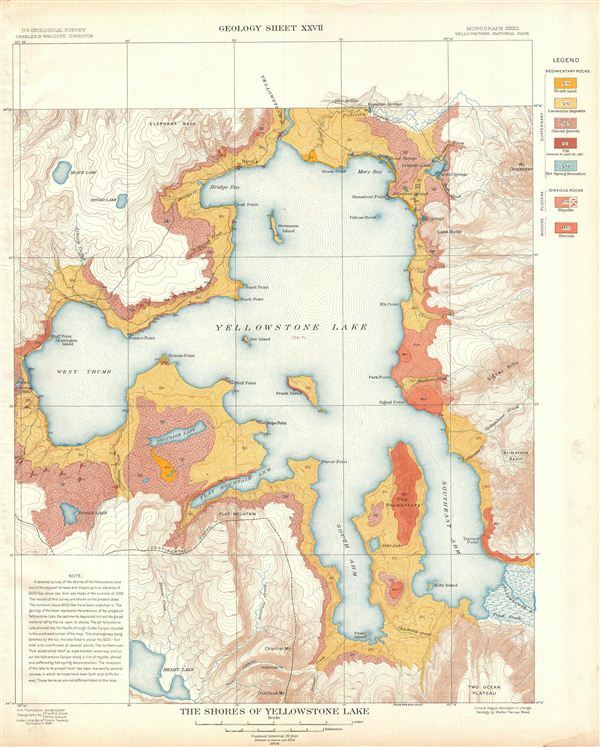 A fine example of Arnold Hague's 1904 geological survey map of the spectacular shores of the Yellowstone Lake in Yellowstone National Park, Wyoming. Centered on the Yellowstone Lake, the largest mountain lake in the United States, the map covers the entire lake along with its shores and adjacent terraces and slopes. This particular map was part of Hague's study of the regions unique geology and the related geothermal activity. The map is color coded to indicate geological zones with a legend set in the upper right quadrant. Also included on the bottom left corner is an interesting note that explains the formation of the geologic features of the area. Published by the United States Geological Survey in 1904.